My Mam is such a very special lady, it is my Birthday towards the end of March and I had just been saying to my family that I was dreading this one as it is my first Birthday without Dad. You see my Dad always bought me a big Easter egg for my Birthday separate to a present from them both even if Mam had put the presents together the Easter Egg was always from Dad. Going into the shops and seeing the Easter Eggs this year made me very emotional not for the fact I wasn't getting an Easter Egg but for the fact that my Dad wasn't here to give me it. So my Mam arrived this morning with this beautiful pendant made with mother of pearl and a Swaroski crystal as part of my Birthday gift given to me early so that I can wear it. Jak this is so beautiful,it bought a tear to my eye when i read your story, as my mum used to be to me like your father was to you,it was her memorium on 4th march the day before my wedding anniversary. 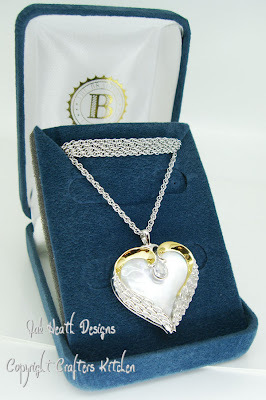 The pendant is so beautiful and the heartfelt gesture from your mother is priceless. Have a happy birthday knowing that your father's love is always with you. Oh Jak I'm not surprised you were reduced to tears it is lovely. What a nice thoughtful Mam you have. Jak that is beautiful and such a lovely thought from your mam no wonder you were in tears...Everytime you wear it your Dad will be with you a lovley thought. Well you've started me off again now Jak. 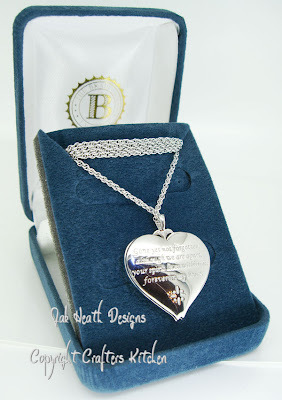 Beautiful pendant from a beautiful mum and a beautiful thought. Jak - that is beautiful. A special present from one special lady to another and for a special reason. Perfect! How lovely is that Jak, what a special Mum you have, so very thoughtful. No wonder you were in tears. Jak, that is so lovely, what a thoughtful Mum you have, brought tears to my eyes just reading your post, such lovely words. 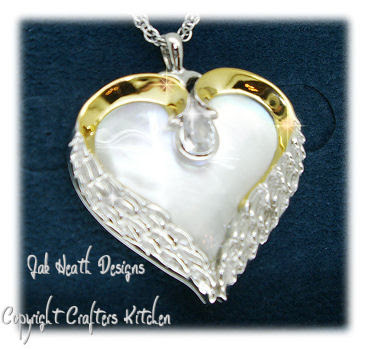 Jak the pendant is beautiful and all the more so because it was given to you by your Mum in memory of your Dad. I lost my lovely Mum at the end of January and my world is so empty without her so I really do know how you are feeling. Just beautiful, jak. A beautiful necklace, a beautiful thought, and a beautiful memory. That is so beautiful I can see why it reduced you to tears. If your dad is watching over you he will be so proud of his wife and daughter , thats was a very lovely gift your mum brought for you. Oh Jak, what a lovely pendant, thought and Mum. This will have a double meaning for you I know. A gift to remember both of your parents for the rest of your days. Bless her heart. Jak the pendant is gorgeous, and what a lovely thoughtful mam you have. I lost my beautiful mum 2 1/2 years ago and I miss her every day. The first anniversaries of all the important celebrations are the by far the worst. Will be thinking of you on your birthday and sending you some big hugs to help you through the day. goodness me, that's so wonderfull. Ahh, just seen this Jak and it is lovely. What a wonderful idea and how special that your Mam has bought it for you. Och it's lovely Jak - hugs to you at this time. This is so beautiful, Jak! Oh Jak, what a wonderful gift from your mum and i am in floods of tears here. Thank you for sharing it with us. Jak the pendant is absolutely beautiful and the words could'nt be more true, he is with you in spirit always. God bless. A beautiful gift from you Mum, your Dad meant so much to you and he will live forever in your heart. The inscription brought tears to me. What a wonderful thought, your Mam is a special lady... Wishing you a very happy birthday for later in the month and hope you are abl eto remember all the good times with your Dad. Oh wow what a gorgeous piece of jewellery and also a beautiful sentiment too. Your dad will definitely be with you for your birthday. Your mum sounds like a lovely lady.